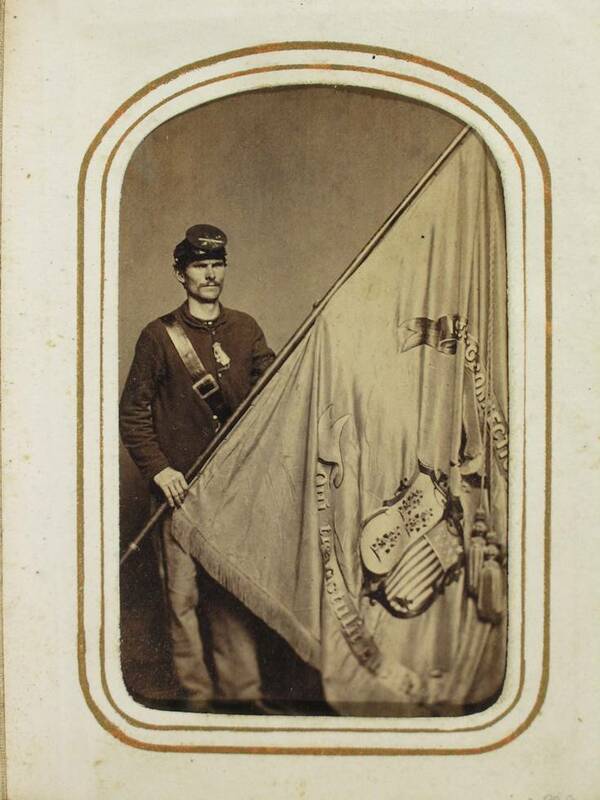 During the Civil War Connecticut units each carried two flags, a national and a regimental flag. Soldiers learned to focus on their flags in battle. As long as their flags were flying, there was hope. At the battle for Morris Island, South Carolina, color-bearer Gustave DeBouge of the 6th Connecticut Volunteer Infantry (CVI) fell dead on the regimental flag. Captain F. Osborn pulled it from beneath DeBouge’s body, causing the flag to tear in half. He quickly mounted the remaining half on his sword and urged his company forward. During the battle, as Colonel John Chatfield was carried from the field with his second leg wound, he said of the colors, “Keep them, keep them, as long as there is a thread left.” The surviving half of the flag is on display in the Hall of Flags at the Hartford State Capitol. Connecticut’s first Civil War battle flags were hastily purchased from Frederick F. Rice, an artist and sign painter in Hartford. The regimental flag consisted of an eagle grasping a split shield with the state arms on one side and the federal emblem on the other. 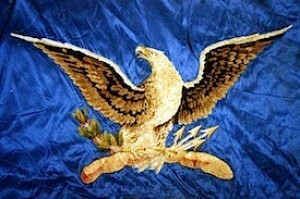 The canton (top inner quarter) of the national flag consisted of stars surrounding an eagle landing on a federal shield. Both clearly symbolized support for the federal government. When William Aiken, Governor William Buckingham’s son-in-law, was appointed Quartermaster General of Connecticut, he went to Tiffany & Co. for flags. In early 1862, Tiffany designed three new patterns to be used for regimental flags and a special crest that remained in use until replaced by a single grapevine after World War I. Two of these patterns were to be used for embroidered flags, and one was to be painted on silk. The painted flag has four allegorical scenes. During July 1862, Connecticut received approval to order national flags from the federal government; therefore, Connecticut no longer paid for them. They could, however, be designed, and privately paid for, if approved by the Connecticut quartermaster general. When the war ended, veterans brought home what was left of their flags; these were eventually stored in the state arsenal. When a new capitol was built in Hartford in 1878, provisions for exhibiting the flags had been made. A century and a half after the Civil War, the Hall of Flags continues to honor our men and women of all wars who died or suffered so much for our freedom. 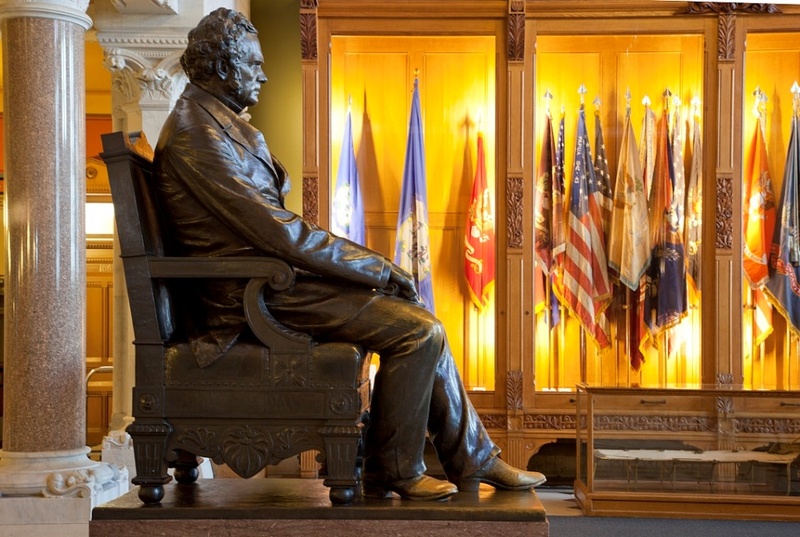 Gerry Caughman, a tour guide at the Connecticut State Capitol in Hartford since 1979, began taking care of the Capitol’s 170-piece battle-flag collection in 1985. Jordon, Cara. “The Connecticut State Battle Flag Project - Restoration.” Museum Textile Services, 2016. Link.